WhiteBar = 100, Black = 0, ColBarsMax = 75, ColBarsMin = 0. 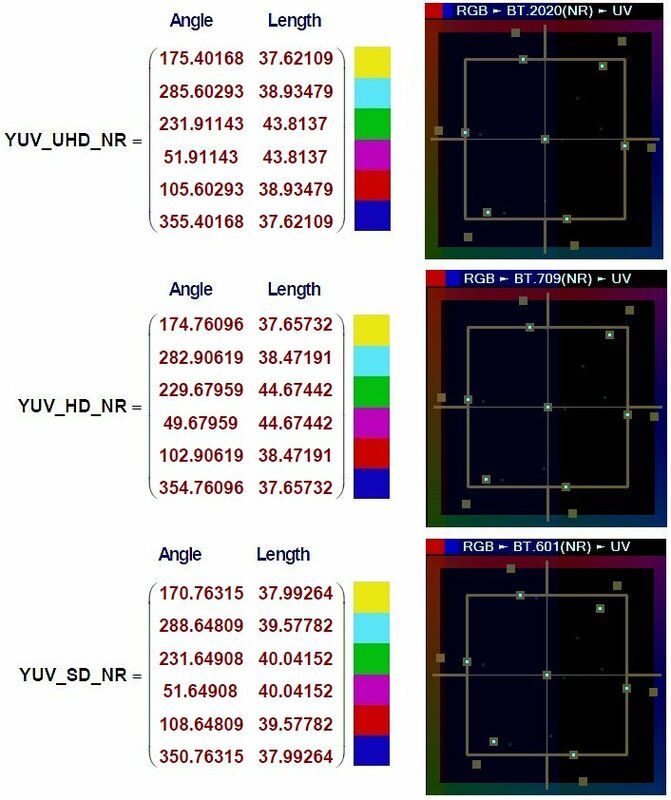 For practical applications we should convert the relative YUV values in percents to Narrow Range digital data levels. To cover several bit depth cases it is convenient to present digital levels in “8 bit fractional” notation invented by BBC engineers; this notation is suitable for any numbers of bits. The nomenclature of widely used SMPTE Bars is 75/0/75/0. Thus, the only difference between SMPTE Bars and EBU Bars is the White Bar level. This 75% White Bar is often called “75% Gray” (strictly speaking, we should not call it “White”). For six other (colored) bars the YUV values of SMPTE Bars are the same as shown in EBU Bars matrices above. 16 + 0.75 × 219 = 180.25, so the 8 bit rounded level = 180. 180 × 4 = 720. The Vectorscope shows you color Hue and Saturation; in math terms it means the UV Vector Angle in degrees and Length in percents. Strictly speaking, traditional Vectorscope graticule label “Saturation” has not much in common with the corresponding colorimetry parameter. Better name for this label could be “Chroma Intensity” or “Chroma Level”. 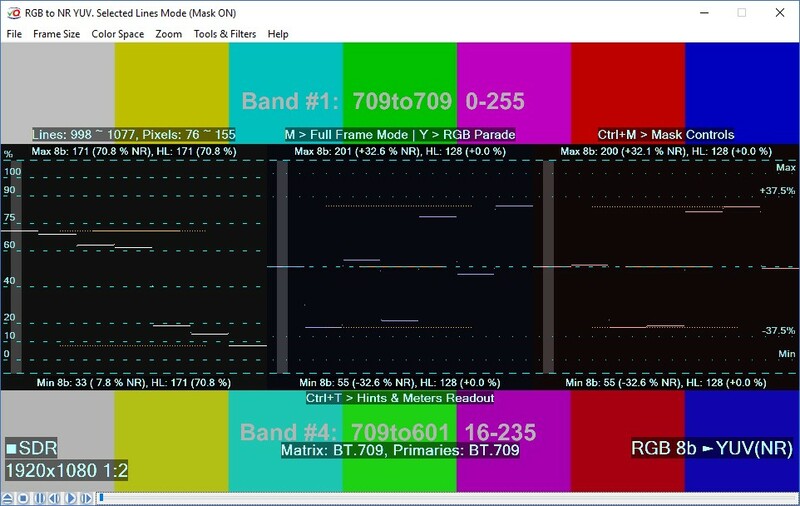 Yellow rectangles on the VQV Vectorscope tool display show measured UV “Chroma Volume”. This is quite handy for at glance checks. 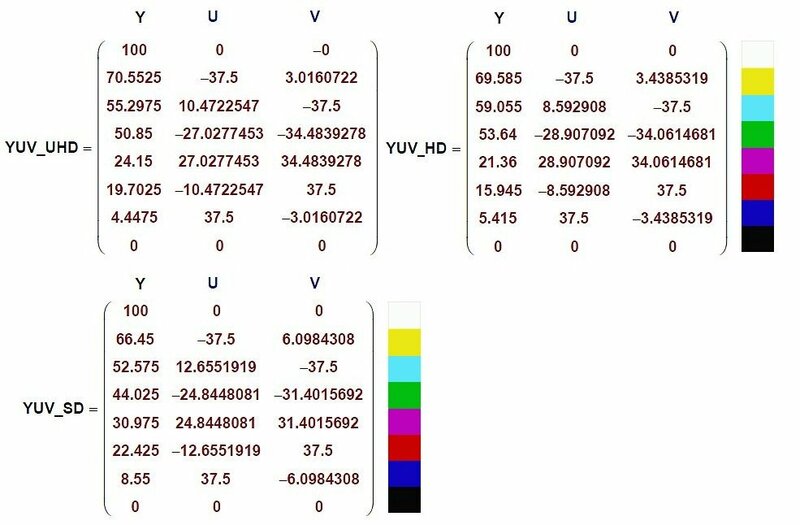 Note that Chroma Volume numerical value differs from UV vector length aka “Saturation”. On the Vectorscope display all bright Cyan spots should be within the corresponding target boxes (ideally, at the central position) and UV Chroma Volume numerical readout should match the nomenclature specified for the pristine color bars test. The target boxes layout automatically follows the color matrix type specified in the analyzed file metadata or selected by the user. 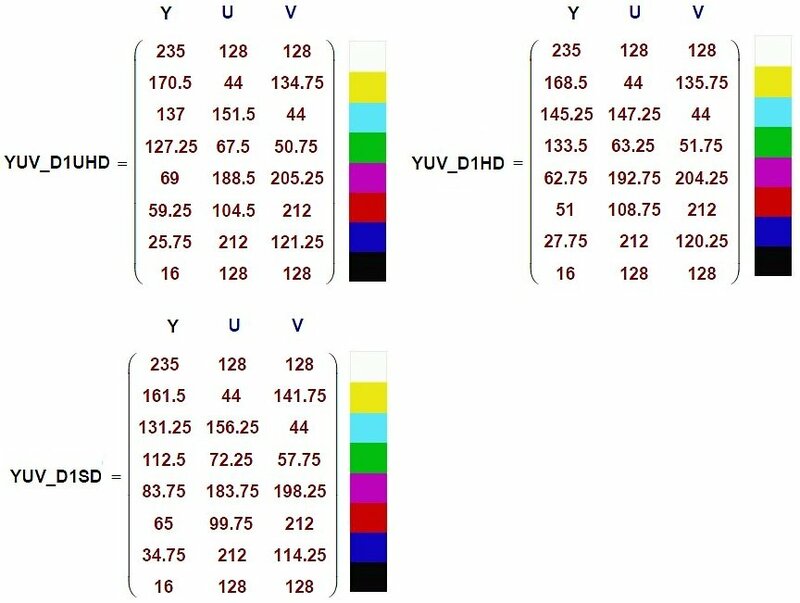 For any color space 75% and 100% target boxes are displayed, thus allowing to detect mismatch between the declared nomenclature and actual UV data. What may happen in case of wrong YUV to RGB matrix selection? The resulting colors may appear quite different. Next two VQV Waveform Monitor screenshots show strong discrepancies between correct Band #1 and wrong Band #4. 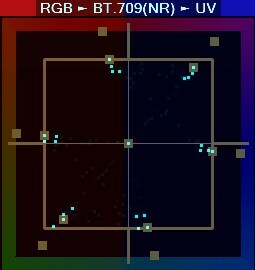 In both cases VQV was converting input FR RGB 8 bit data of the selected line range (i.e. of the selected Band #) to NR BT.709 YUV waveforms using correct built-in matrix. 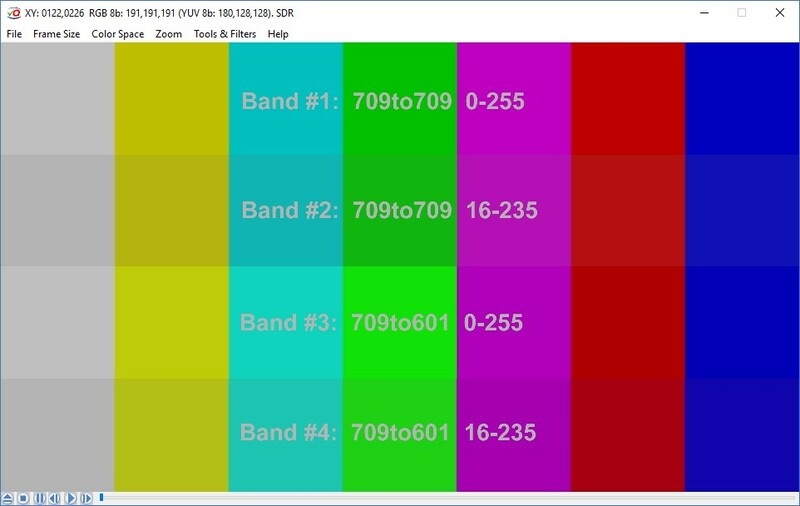 Interesting fact – wrong colors saturation may go up or down, but the overall Chroma Volume readout shows correct 75%.